Christopher G. Nuttall has a fan in me, I’ll have to admit. After devouring his Ark Royal series (which was an homage to both Battlestar Galactica and David Weber’s Honor Harrington), he’s climbed into the “probably going to buy” ranks of writers I enjoy and will gladly spend money on. 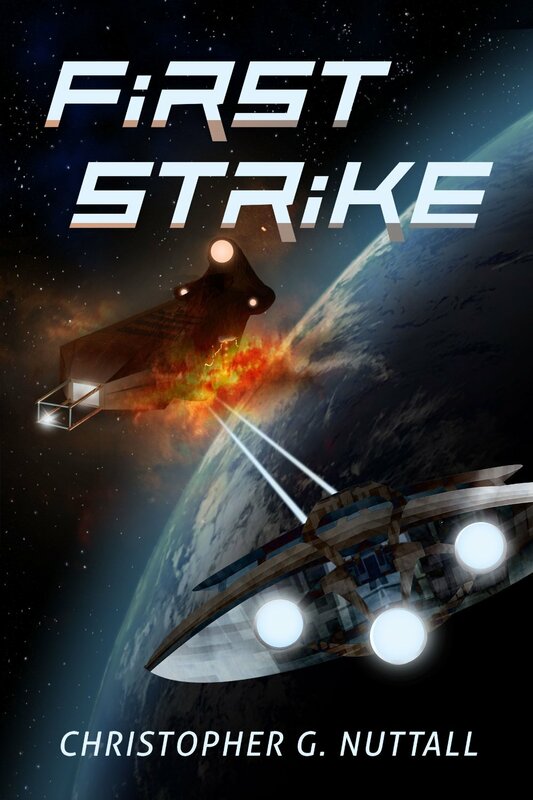 So I didn’t even hesitate when his publisher sent us First Strike, the first book in a brand new series. From the very beginning of the book, humanity faces a crisis unlike one that has ever been seen. An alien has invited the major leaders of the world to a summit to assist them — and warn them that the barbarians are at the gate, and humans have very little time to prepare. Then Mentor disappears, and the book fast forwards to 15 years later, when a new member of Mentor’s species arrives to warn humans that a grave threat has emerged — the same one which Mentor warned them about years before. The Funks, as humans have taken to calling the neighborhood bullies on the intergalactic scene, have already conquered one human colony world (through nefarious legal means, proving that everybody in the universe is cursed with lawyers) and are quickly moving to take the rest of Earth’s space in the same manner. In order to prevent Earth from falling under the “benign” rule of oppressive aliens, the Federation decides that a first strike is necessary to warn the Funks that Humans will not go quietly into the night. Enlisting the aid of billionaire merchant and former Navy Captain Joshua Wachter to harass the Funks trading lines in the rear (which, given the vastness of space, is something that the author never talks about how they triangulated such a thing in the first place, much to this reviewer’s annoyance), Admiral Tobias Sampson has come up with the plan that with either protect humanity for all time — or be its untimely doom. Nuttall’s writing is clear and concise, staying away from the common every day tropes that usually litter the pages of new military science fiction. Minus a few name drops of Star Trek characters throughout (Beverly Troy was humorous, but I’m that kind of nerd…), that is. The action is well-timed and hard-hitting, and there is just enough boom to make me happy without turning it into a Michael Bay movie. He does his aliens well, creating one character (Lady Dalsha, a Funk) whose evolution on-page from enemy to villain is worth noting. The plot is well done, though the subplots could have been fleshed out a little more, but it did not leave me wanting. Some characters were done very well, while others were there and then simply gone, leaving no hole from their disappearance from the pages. All of these problems, however, are very minor ones, and really not worth the energy to worry about. The problem worth worrying about with this book (and truthfully, the series as a whole moving forward) is, quite frankly, plain. It’s vanilla SF (which I can enjoy, if done properly). Everything in the book goes humanity’s way, save for one little hiccup. While I’m all for the nerdy kid punching the schoolyard bully in the mouth and standing up to him, I still want there to be some drama. That element is missing from the book, the uncertainty of what is to come, and the actual feeling of humanity’s desperation is not felt. Indeed, I continued to get the sense of Imperial British “Oh dear, old boy… we might just die. Hand me another crumpet, will you?” Regulars who were stuck in a air-conditioned office battling paperwork instead of a “do or die” scenario. It lacked a sense of urgency, in other words. All in all, I enjoyed it. A little too plain, but I have high hopes for the rest of this series moving onward. Definitely would recommend.